On Tuesday July 11, President Michel Temer sanctioned law 13,465 / 2017, based on what was previously a provisional measure, MP 759, which deals mainly with federal land regularization. The presidential vote occurred after its second approval in the Congress, determined by a preliminary injunction of the Supreme Court, which considered the changes made to the law considerably substantial, changes resulting in eight amendments (from more than 400 proposals). Civil society has organized debates about the right to housing and the effects that proposals to change urban legislation, including law 13,465, will have. Among these debates, a Seminar on Housing Rights and Changes in Urban Legislation was held on June 23 and 30 at the Public Defender’s Office of the State of Rio de Janeiro, and a debate on the new law 13,465 was held by the Brazilian Bar Association (OAB) on June 26, bringing together lawyers, residents of vulnerable areas and other members of civil society. “You cannot treat the unequal equally. The same mechanism cannot regularize a building in (the elite) Barra da Tijuca and in a favela,” said Jaqueline Montenegro, president of the Regional Electoral Tribunal of Rio, during the event at the OAB, referring to the new federal legislation that contemplates regularizing both Areas of Special Social Interest (AEIS), which are primarily favelas (referred to in the legislation as Reurb-S), as well as middle-class housing and major developments (referred to as Reurb-E). In practice, the mechanism applied in each case depends on the applicant’s self-declaration about the category in which his or her property falls, and the subsequent approval of the municipality within 180 days, after which the modality chosen by the applicant on the form will hold. This determination risks that the prevalence of the petitioner’s choice becomes the rule, not the exception, due to the overload on the municipality, and this will likely open space for corruption. Thus, large enterprises may claim fee exemptions made to low-income properties regularized by Reurb-S by declaring themselves Reurb-S-eligible properties, for example. Jaqueline also denounced the inadequacy of a law written by people who have never stepped into favelas and who are now regulating life in favelas, and advocated for more precise legislation rather than a general and ambitious law like this. Claudia Franco, a professor of Civil Law and a specialist in direito real de laje, or legal rights to sell or rent the consolidated slab, or laje, on top of one’s home, said in the same event that the role of regularization law is to equalize the conditions that the housing market makes unequal and, therefore, it is necessary to overcome the definition of housing as a commodity, in order to achieve social justice. “The favela is the architectural realization that we do not respect social rights,” she said. She believes there is discontinuity between the direito de laje set forth in the law and the direito de laje da vida real. That is, she sees a discontinuity between the way the new law contemplates the rooftop buying and selling rights from a market perspective, versus the reality of how rooftops service people’s true housing needs in Brazil. Whereas favela residents are concerned with the right to concretely possess and occupy the laje, the new law speaks only of legal ownership. Franco believes that simplification of regularization will ease the process for the middle class, but will not benefit residents of favelas as much, since the bureaucracy and costs involved in the registration process will remain prohibitive. The costs associated with the process (notarial documentation and, in the case of Reurb-E, mandatory technical assistance) will represent an increase in tax revenue that could be reverted for social purposes, such as a Municipal Fund for Social Interest Housing, as public defender Arícia Fernandes, and Luiz Claudio Vieira, director of land regularization at the Land and Cartography Institute of the State of Rio de Janeiro (ITERJ), said. But this is difficult to achieve because, according to Fernandes, who is also a professor specializing in the Right to the City at the State University of Rio de Janeiro (UERJ), regularization has been legislated into the new law from merely a market perspective, representing a normative and disruptive shift in narrative from that of regularization as the fulfillment of land’s social function (as stated in Brazil’s constitution). In this sense, he believes that the existing policy of concession of use of public lands should be maintained, since it ensures land can be reclaimed by the government if it is being used for purposes other than housing, while law 13,465 allows the new owner to dispose of the land as he or she sees fit, which includes its sale, thus not preventing speculation or gentrification on what were previously socially-demarcated public lands. There are those who disagree with this position, however, and claim that in specific communities, the conceding use has not protected them completely from eviction and that it is preferable to have possession of the land. 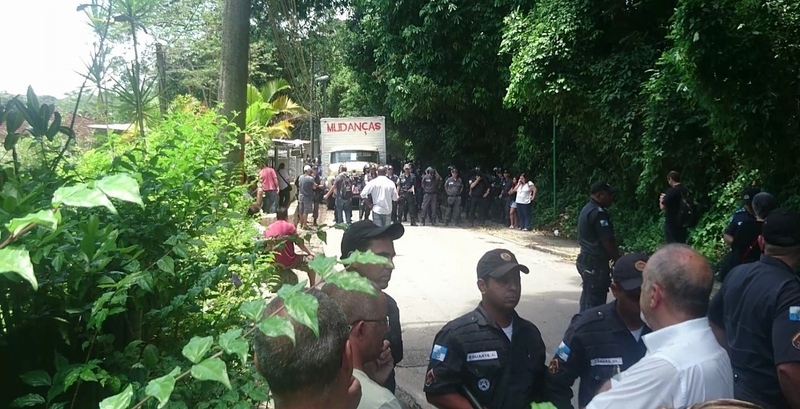 This is the case of Horto residents, as Emília de Souza, a resident and one of the leaders of the local resistance, pointed out during the OAB debate. In their case, she argues, possession brings security against the threat of removal to which the residents are constantly subjected. Emilia reported the existence of an old community regularization project, done in a participatory manner under the leadership of the Union’s Heritage Secretariat, but which was interrupted by the Federal Court of Accounts (TCU) in 2011. For her, the difficulties of the community to obtain regularization include prejudice and the appropriation of an environmental discussion to justify the purported “misuse of a public good” that authorizes actions to reintegrate the possession of public land with ongoing regularization processes. Simone Rodrigues, a lawyer from Vila Laboriaux and member of Rocinha Sem Fronteiras, also defended regularization, and pointed out that efforts to this end often are often impeded by the judiciary’s lack of understanding regarding the social function of land and the lack of political will on the part of the executive branch. One example of this obstacle was the interruption of land titling in Vila Laboriaux by the municipality of Rio de Janeiro, which led to the interruption of the process of regularization in progress in the community through the Past Paper program of the Ministry of Cities. For Rodrigues, regularization is the only security against removal, such as that which occurred in her community during the pre-Olympic period which led to two elderly residents suffering heart attacks. The concern that regularization alone does not solve favelas’ challenges, and that it is necessary to guarantee rights and the provision of infrastructure and services, has been recurrently identified in civil society debates over the new law. “Much is said about housing as if that alone matters,” said Elizabeth Bezerra, a resident of Novo Palmares, Jacarepaguá, at the Public Defenders’ Office. “Recently, the Minister of Health claimed that people invent diseases. For us, it is not enough to be between four brick walls, we need mental health,” she added. Fernandes also defended going beyond the notarial issue when she said that regularization involves the naming of streets, environmental adequacy, infrastructure upgrading, access to collective equipment and mechanisms of participation for residents, so that favelas are publicly treated as part of the city which in fact they are already intrinsic to. The NUTH also considers that the real estate sector intends to expel vulnerable groups to the urban fringes, exacerbating the ongoing process of real estate speculation and peripheralization. Law 13,465 has the potential to contribute to this process by inserting land from lower income families into the formal market, which will allow the use of land as a value reserve, in a speculative way, instead of being used for its productive and social value. “The city today is no longer a meeting point for social exchange. It has become a business. The city removes people from wealthier areas and inserts them in the periphery with the illusion of improving their lives, only to generate wealth of which they are not a part. But the city is our space of struggle. To combat gentrification we need to get out of the periphery and go to the streets to fight, “said Jefferson Salazar, adviser to the National Federation of Architects and Urbanists (FNA), during the same event. Fernandes, for her part, said that we must fight for municipal legislation to mitigate the effects of Law 13,465, since it depends on other legislation to be operational. In addition, she argues that existing Zones of Special Social Interest (ZEIS) regulations should provide for the possibility of land reclassification after the land regularization process via Law 13,465, to prevent gentrification by the continuous acquisition of land by private capital for the construction of large developments. Despite the fact that ZEIS is mentioned in law 13,465, it is stated in a non-binding manner. That is, the land regularization process is not conditional on establishing the social interest of the land being regularized. This article was written by Juliana Torres, Luisa Fenizola, and published on July 28, 2017.